In the mid nineties, Stanislaus County had a growing number of non profits and a developing United Way agency. Relatively few opportunities existed for professional development of nonprofit executives or development staff. In 1996-97, Carole Richard, then Executive Director for Resource Development for the Yosemite CCD, and Patty Stone met to discuss this unmet need. Richard had explored several organizations for nonprofit executives and attended her first Association of Fundraising Executives conference in Los Angeles (then called the National Society for Fundraising Executives). She located the Capitol Chapter in Sacramento and experienced firsthand some of the workshops and lunch meetings their chapter held and was impressed with the quality of education. She and Patty Stone researched the options for formation of a chapter. Through Stone’s efforts, other non profits were contacted to identify their interest in gaining opportunities for learning more about the profession of fundraising. Fundraising consultant David Barnes offered his support on chapter formation, having assisted and founded other chapters in Arizona and California. 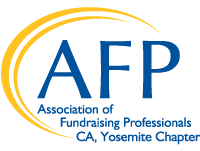 In 1998, after working with the Association of Fundraising Professionals to officially form a chapter, the small working group of interested development officers filed incorporation papers in Sacramento and incorporated as the Yosemite Chapter of the then NSFRE. Long discussions preceded the chapter’s formation on the issue of what to name the new chapter. Because no other chapter existed to the north until Sacramento and to the south until Fresno, the group wanted to reach out to other areas, including the Sierra Nevada foothills. To accommodate the large geographic region, the name “Yosemite Chapter” was selected. To the founders’ delight, at the 1999 (check) AFP conference, the NSFRE announced the Yosemite Chapter as among the newest and the 150th of their chapters (today there are over 200 chapters internationally). The chapter was fortunate to have space donated through Stone’s leadership as then Executive Director of Doctors Medical Center Foundation. The group met in donated space at their headquarters on McHenry Ave. From time to time, they experimented with other locations, including the former Stanislaus Surgical Center on Yosemite Blvd. Incorporated as a small size chapter of the then NSFRE, the organization had a minimal budget, but nonetheless coordinated monthly lunch/networking meetings with speakers. The first National Philanthropy Day luncheon was held in 2001 at the Doubletree and drew over 100 people from the nonprofit community to celebrate philanthropy and generous donors in our community. In 2005, Stone worked with the United Way and their then President Linda Avedon, and the two convinced the Modesto Rotary to collaborate on this luncheon. The 2005 Philanthropy Day luncheon, held in cooperation with Modesto Rotary, raised the visibility of the AFP Yosemite Chapter and increased the participation to over 200 attendees. Since that time, the chapter continues to collaborate with Modesto Rotary on this historically biannual event, which has evolved to an annual event in 2012. In between the former biannual luncheons, Fund Raising Academies, a series of all day workshops, were led by various AFP members and attracted from 30 to 125 non profit staff in the region. The Academy was held at downtown locations such as the Doubletree as well as other facilities such as Samaritan Village, in Hughson. Through continued marketing and growth of the chapter, it has grown to over 50 members. The Association of Fundraising Professionals (AFP) represents more than 30,000 members in nearly 200 chapters throughout the world, working to advance philanthropy through advocacy, research, education and certification programs. The association fosters development and growth of fundraising professionals and promotes high ethical standards in the fundraising profession. For more information, www.afpnet.org.